We’ll keep you covered with our warm up jackets; from zip up to snap front, no matter your body temperature, you are sure to find the one that will allow you to stay warm and perfectly comfortable. The pockets in many of these nursing jackets save you time, allowing you to keep important medical gear and personal accessories within easy reach, and preventing unnecessary zipping and unzipping. 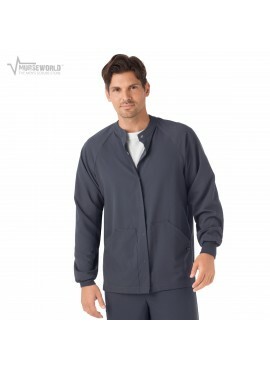 There are multiple other features that enhance the practicality and contemporariness of many of these medical jackets, including antimicrobial technology, odor prevention properties, and cozy rib knit cuffs. Of course, you can choose the brand you like best; whether it’s Jockey, Cherokee, Carhartt, Landau’s or Barco. Cold temperatures will barely make a difference to you when you’re clad in one of these comfortable jackets; you’ll feel the warmth as you keep your clothes dry whatever the weather. Select the style and color which best matches your preferences. Button front? Zip up? How about a short sleeve scrub jacket? Or would you prefer a bomber style perhaps? Peruse our scrub jacket collection and find the perfect one for you. Please feel free to contact our dedicated sales reps at 888-501-4221 with any questions or comments regarding the purchase of your medical uniform, and they will do our utmost to assist you.